A deceptively simple question that many of us find surprisingly hard to answer. Mere words simply aren’t always good enough to tell a seemingly complex story. One of the easiest and most effective ways to help you out is the Brand Circle. 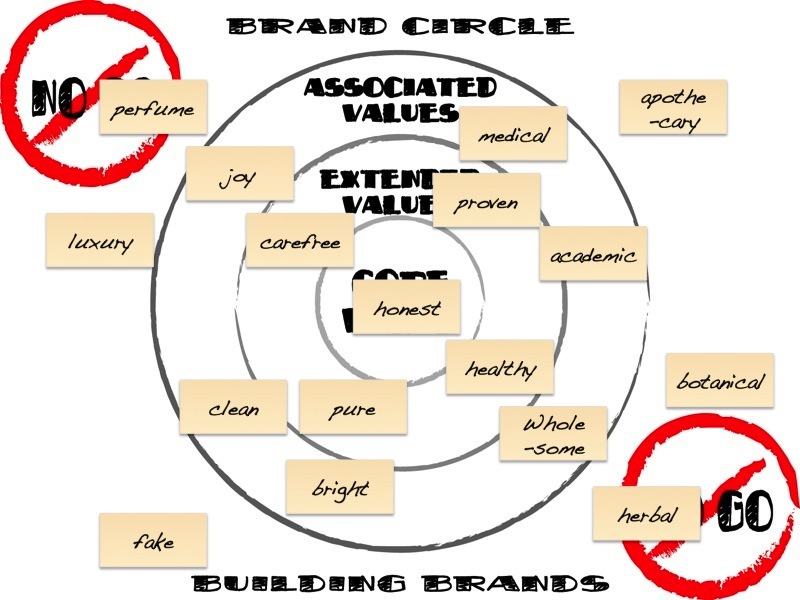 A Brand Circle is a simple tool that helps you create a visual map of your brand. Nothing more, nothing less. At bransoncompany we use a slightly adaptated version of Hugh Davidson’s model that looks like this. How to use the Brand Circle? It’s a straightforward proces: you start from the inside and work your way outward. The first question you should ask: “What is the first thing your customer should think about your brand?” Try to answer this question using only a single word. It may take some time and debate, but you should really aim to boil this down to one word. A list of three or five or seven different values won’t do, so try to avoid that. 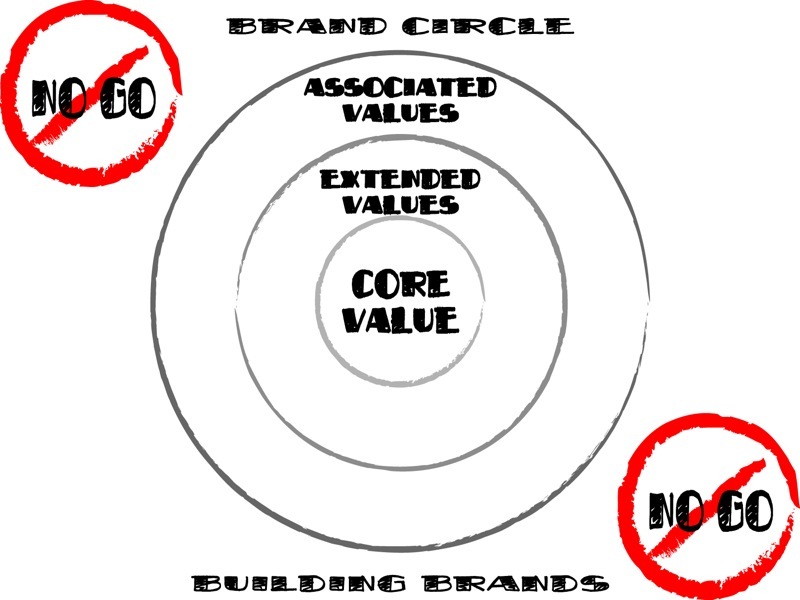 You now have your brand’s Core Value defined. For Nike this core value could be ‘competition’, for Disney it could be ‘happiness’. All activities of your brand should ooze this core value from their pores. If they are not – you’re not doing things right. Next are values that are closely related to the Core Value, they are the Extended Values that strengthen and support it. These are also values that you actively want to cultivate and make part of all the brand’s activities. You may find that some of the values you discarded earlier end up here. 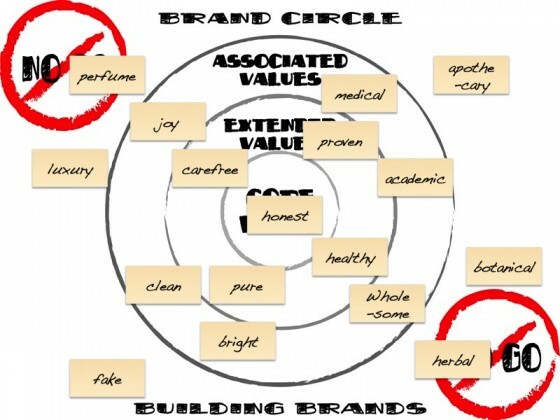 The third circle encompasses your brands its Associated Values. These values may not be expressed explicitly but they do map out the full width of associations you want people to have with your brand. What are the major benefits of using this tool? Communication – A good brand circle is concise and easy to understand, making it ideal to share your results with others. We’ve used brand circles to brief package specialists, logo designers and copywriters. Multi-purpose – The same basic method can be use to map and evaluate services, products and other activities. Ease – Getting together and mapping out your brand is a lot of fun and it’s very easy to do: all you need is few flip charts, a stack of post-its and some markers and you’re good to go. Interested in using the brand circle yourself to explore an existing brand or building a new one from scratch? Please do! I recommend a nice room with lots of air, light and orange-juice, away from mobiles phones and other distractions and giving it a go. The end result might surprise you. This entry was posted in branding & marketing and tagged branding, marketing, tools by Bastiaan van de Werk. Bookmark the permalink. Today i have to work on branding and you have been a really good help for me. I study this in my gradute course but i think the explanation you give in this website it´s very cool. thanks for stopping by and your nice compliments! Good luck with your assignment!